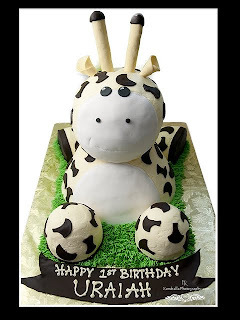 First - This is one of the cutest Birthday cakes I ever saw - Who would think to make a 3-D giraffe birthday cake? The cake is too cute to eat but the folks in attendance ate it up quick. This cake was made by Amy's Cakes and I am always amazed how nice her cakes look. 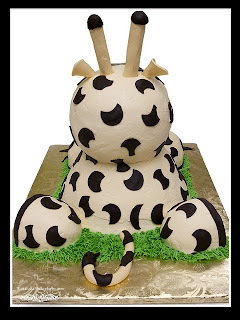 Second - When I saw this cake, I thought, I better get as much detail as possible. I used my Nikon SB800 on the camera and pointed it to the wall next to the counter (camera left). It created a soft light on the left side of the cake and a soft shadow on the right side. 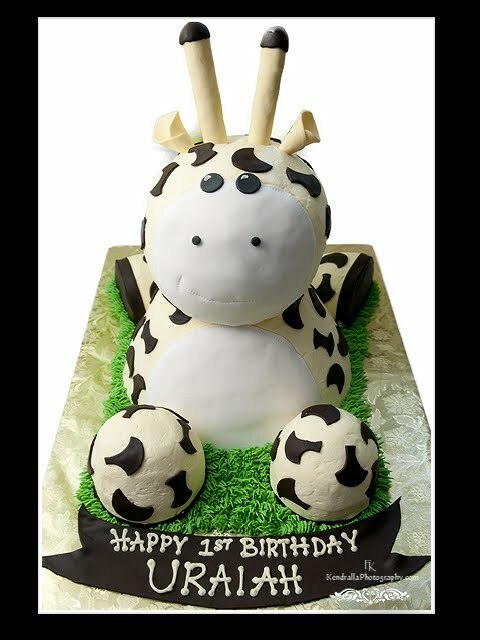 I used the same technique to photograph the back of the cake (I did the same for the side and a few close ups of the 'feet'.) The critical point is to diffuse the flash. I used the wall and it created a very soft large light that wrapped around the cake's features. If a wall isn't close enough to bounce off or if the wall is very dark, then have a guest with a light (hopefully white) shirt stand near the cake and bounce the flash off their shirt. I have a large and small reflector that I use when needed. Another key point about photographing cakes is time. Rarely is there time to set everything perfect compared to a controlled shot at home or in a studio. Since this cake had some much character, I took more shots than I typically do for a 'flat' cake. Therefore, it is critical to get the shots of the cake as soon as possible. I try to get the shots as soon as I arrive to the event-reception. This buys me a few minutes and eliminates rushing. If you wait until minutes before the cake cutting, you might miss something. I use the same technique as a wedding photographer when I am photographing a wedding cake. If special lights exist, use them to create drama. For example, if the party or wedding reception has a DJ that utilizes uplighting, then their lights create very nice accent lighting on the cake. This was shot with my Nikon D300 and Tamron 17-50. Hi, I love your blog... I am a baker and just recieved the Nikon P500 as a birthday gift, maining to photgraph my cake creations. I would like to set a make shift studio in my garage to photograph my creations. Any tips you can offer me? 1. Set up lights (you can use something from Home Depot) to avoid using the flash on the camera. If you use the on camera flash, then put some tissue over it to diffuse it. 2. I suggest using a contrasting but complimenting background. If you have a white cake. Do not put the cake against a white background. It could cause the cake to disappear in it or cause the cake to look yellow when it is white. 3. I suggest getting a folding table or something similar that you can cover and make a nice wall around. Another thought is to get a turntable that you can put in your three walled creation enabling you to turn the cake and get all angles without moving it. Lights and white balance - I am not sure if this camera has white balance adjustment on it but if it does, play with the white balance to match your lights. If you get florescent lights, then your white balance must be set to florescent. I looked on Nikon's site and it has white balance adjustment. If you get lights that are tungsten (incandescent) ensure you set to tungsten. If the white balance is wrong then you will get the yellow or green cast over the image. 3. Adjust white balance in the camera to match the light. 4. Play with the scene settings on the camera. For a white cake, try the snow scene setting. Thank you! I will let you know, it's still cold in michigan so once weather is a tiny bit nicer, I plan to make a spot in garage.